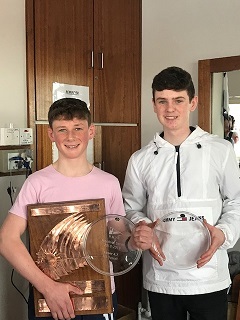 NYC Junior members Conor Gorman (pictured L) winner overall and Hugh O’Connor (pictured R) 3rd overall in the Laser 4.7 class in Dun Laoghaire Frostbite Series . Well done! DBSC Frostbite Series,which has been running for over 40 years, ran every Sunday from November 4th to 31st March. The boys will be taking part in the Laser Munster Championships in Baltimore over the Easter weekend and then onto RCYC for the 2019 Youth Sailing Pathway Nationals from 25th – 28th April. The very best of luck to to all competitors!